This fantastic navy blue top from our friends at Mayoral is the perfect choice for your young man this Winter. The charming cartoon robot design creates a striking and charming piece that he will want to wear over and over again! Made in pure cotton jersey, to ensure he stays as warm as possible even on the coldest of days. 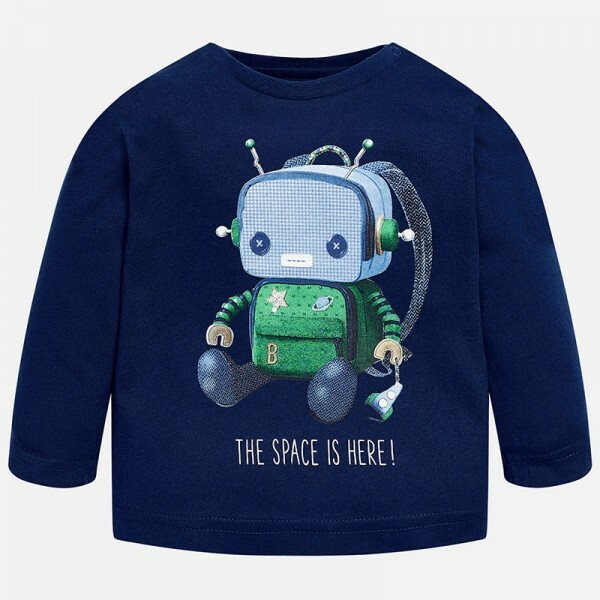 The robot motif is sure to appeal to your little one's taste, as it is a genuinely unique look that he's sure to love. Made in unbelievably soft cotton, he'll find it very comfortable and easy to wear. It's an effortlessly easy to wear piece that can be styled up or down for any occasion, and he'll look totally amazing.